Search Engine Optimization (SEO) is maybe by far the most confusing traffic-generation strategy when you’re just starting out. Sometimes, you may have wondered that why your sites have so many backlinks, but still couldn’t get the high rankings as you expected. To explain this, SEO guru Jonathan Leger introduced his “link pyramid” theory that you need to make your site’s link structure look nature in Google’s eyes. We all know that all incoming links are not created equal. Links from authority sites are much more powerful than links from niche blogs, general directories or blog comments. But does more authority links always mean better rankings? The answer might not be what you think. To make it nature, you want to construct what he calls a “link pyramid” for your site. This pyramid is a 3-level structure of links: 1) your base links, 2) your mid-range links and 3) your highest quality links. The foundation of your link pyramid are your base links. Like an actual pyramid, the foundation is the largest part of the structure. Base links are links from niche article sites, social bookmarking sites, blog comments, deep inner pages, etc. In other words, base links are lower quality links. It’s important that you have a lot of these links than any other kind of links, because Google’s algorithm thinks that this is “natural.” So you want to make sure your link pyramid has a solid foundation of base links. 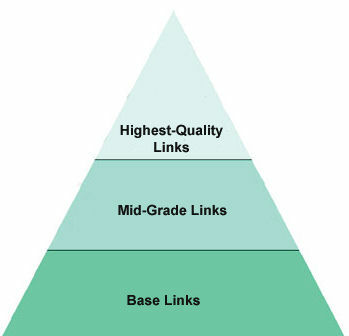 The next level of our link pyramid are your mid-grade links. These are links from web sites that have more authority than the sites mentioned previously, but still may not be top-notch sites. For example, sites that re-use EzineArticles content, mini sites and sales letter sites. Mid-grade sites usually have a fair amount of backlinks to them , so they have a bit of authority. That’s why Google counts links coming from mid-grade sites more individually valuable than base site links. Of course, that also means that you don’t need as many links from mid-grade sites as you do from base link sites. For most long-tail keywords, you don’t even need these highest-quality link in your link pyramid. You can usually rank just fine with the base links and mid-grade links. However, when you’re aiming higher, you need to collect them. “Highest-quality links”, mean links from sites that already have a lot of links aimed at them. In Google’s eyes, site with a lot of links aimed at them have “authority”, and anyone these “authority sites” link to must also be important. The good news about getting highest-quality links is that a few links can make a big difference. So while these links are more difficult to acquire, you don’t need nearly as many of them to rank well for your keywords. If you want excellent rankings in Google, it’s important that your link pyramid look natural. That means having a large number of base links, a lesser number of mid-grade links, and a few top-quality links. I personally use a couple of mass article submission services like Unique Article Wizard and ezArticleLink to get both solid base links and mid-grade links that give the sites sure footing in Google’s rankings. When base links plus mid-grade links aren’t enough to rank your site on the page one of Google, then you should consider to get some highest-quality links with BuildMyRank. Google loves the links from this network, because every site in the BuildMyRank system has a public PageRank of 2-5. So you get quality backlinks across an ever-growing network of established sites by hand-pick. 1. Sites with PageRank are crawled often, so your links get picked up faster. 3. Sites with PageRank generally have quite a few links coming into them, and those links give the site more “authority” in Google’s eyes, which mean links FROM those sites matter more. By using the link above, you get 10 backlinks for free when you sign up. You can use these free links to start generating high PR backlinks RIGHT AWAY. Wow. I never heard of the link pyramid til I read this. Very good. I’ll be sure to follow that it was an awesome post. I’ll be subscribing to your blog, can’t wait to read more. Wow..amazing article. I don’t hear it yet before,but it’s very useful to understand about it. It’s useful for my internet marketing system (Twalk 2 & Snipr). I am a SEO expert. The Link Pyramid is exactly correct. I am currently working on a new site of mine. Will let you people know about the exact results in few days. Thanks Henry for this type of very informative post. we all know what importance link building has and its pleasure to know about link pyramid. I will apply this to my site and hope for best results. This info is really useful for increasing the page rank of my blog. “Link Pyramid” Structures are a better way than Link wheels ? Which method is the safest way with Google ? I think when you talk about squidoo and blogger, you are taking about multiple-level linking. But in this post, the link pyramid only suggests that you should get both a small number of high authority and large number of low quality links to your money site. BMR links should be no doubt on the top of link pyramid. Now I’ve still got more than 100 PR4 links, 30 PR5 links and 3 PR6 links with BMR. I even used to get a couple of PR7 links, but the PR dropped after the recent PR update. I will publish a full in-depth review on BMR shortly. Hi, i am trying to build a link pyramid but what would you recommend a link pyramid over a link wheel? Do you think link pyramids are better than link wheels? Or should I just do both. Great article, btw Henry. Just started to learn seo and while searching google i bumped on your website which i found really informative..thanks for sharing your tips. Thanks for the nice explanation. This should really help people who are trying to learn SEO. Hi Henry. I enjoyed your informative article. I would be curious to know if you have actaully used the link pyramid technique and how it worked out for you. Could you share a sample site and mention how long it took to build the pyramid and achive the rankings you desired? ezArticleLink is one of the better linkbuilding systems I’ve seen in a while, plus they have a really unique system they use to spin and syndicate your articles, this is a must have, even if you go with the free account.